A simple method for taking the back from the Caio Terra style high knee shield starts with your frame. Put your knee up by their chest, buttressed by your arm. You've got two main options for arm placement. If you put your elbow inside your knee, that makes it tough for them to crush your knee down to start their pass. Alternatively, you could put your elbow on the outside of the knee. That means you can reach across with your hand to their other shoulder, creating a frame comparable to the solid defensive frame from under side control. For the back take, it's probably easiest to put your elbow on the inside, but that's just my personal preference. Kick your knee shielding leg forwards, out under their armpit. Into that gap, reach your hand through too. The momentum of the kick - combined with the sudden departure of resistance to their own weight and forward pressure - should enable you to 'dive' through that gap for the underhook, swivelling through to take the back. Xande has some nice tweaks from BJJ Library on the standard knee-in-hip version, where your knee is much lower. 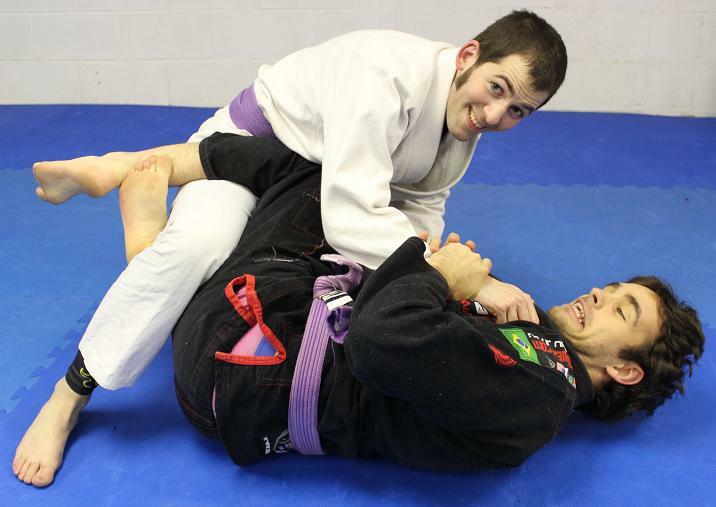 He comes up on his elbow (reminiscent of Ryan Hall's sitting guard approach, stiff arming into their collar bone too), then moves into a 'bodylock', scooting in after he gets the underhook and locks both his hands around their back. From there he can use that bodylock to help adjust round to the back. Teaching Notes: I'm still working out what best to teach from the knee shield. I went with the main knee up by chest version this time round, though I'm still including my notes on Xande's version. I also ended up repeating a good chunk of what we did on Monday. I think that's a good thing in that it's useful to revise material, but I'm also still working out how best to cater for both Monday-only and Wednesday-only students. That's one of the challenges of having quite a few students who train once a week, while at the same time providing some development across the week for students who train multiple times a week.